Kevin Duffus has the real story on Blackbeard. 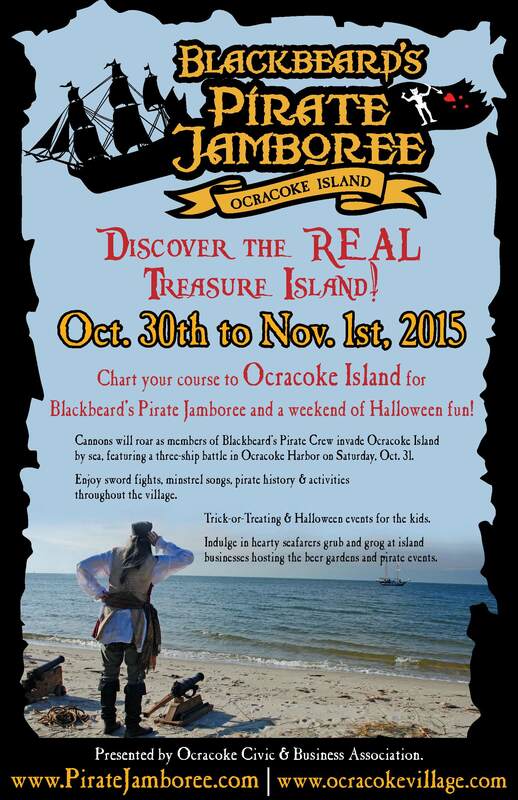 Join us for Blackbeard’s Pirate Jamboree on Ocracoke Island, NC, Oct. 30 to Nov. 1, 2015! Please note that this schedule is subject to change, especially for weather. 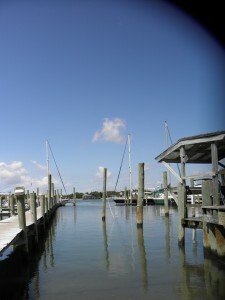 Please visit www.ocracokevillage.com for updates! Join us for an evening with the pirates! Beer, wine, and refreshments available. 7:15pm: “Blackbeard: Revisited” Kevin Duffus, North Carolina’s Historian of the Year, updates on his stunning new research on the ever evolving story of Black Beard and his Crew. Your piracy education continues with the Motley Tones. Hailing from the famous sea port of Raleigh, they have no shortage of seafaring and piracy songs from the ‘60s, ‘70s and ‘80s. Well, the 1760s, 1770s and 1780s. Their harmonious renditions of songs of love, and travel and the sea will help set the mood for the fabulous weekend of piracy ahead. Don’t be shy—you will want to sing and laugh along. And if not, in the true spirit of piracy, they are sure to insist on it! Saturday, Oct. 31 10 am-5 pm– A whole day and night of fun! Yo ho! Just as it was in the 18th Century- you might see The Oyster Lady or the Fishmonger hawking their wares; while song breaks out down the street. Beware if you’re wearing your pirate gear – The Militia will be hunting escaped pirates! Enjoy Good food and Libations at SMacNally’s, across from the Wahab House. There’ll be Pirates about, and don’t forget to bring your official Jamboree Mug for special savings! 11:30am : Meet Black Beard! 1pm: The Battle at Ocracoke! Blackbeard fights off an attack by Lt. Robert Maynard at the 2014 Battle of Silver Lake. 2:30pm : Scallywag School for Kids — for aspiring Young Pirates! A chance for your kids to channel their “inner pirate,” with 18th-century seamanship demonstrations, 18th-century games, and naval weapons and tactics. A great chance to interact with the Pirates! Visiting children are welcome to don their costumes and join the local young’uns for the island traditional Trick or Treat trek around the Lighthouse Road loop. And yes, it’s really that early and will be completely over by dark. Ask for more information at the Pirate Jamboree Information Tent in the Community Square. The Shadow Players will demonstrate sword fights on the grounds of the Ocracoke Oyster Co. Relax, kick back, and enjoy some great beer and food, and be entertained by the Motley Tones and pirate friends. A vivacious and informal round-robin exchange of bawdy songs that date back hundreds of years is sure to make you blush. This show is rated “I” for “Innuendo,” which is PG-17 for you 21st-century types. So, put the little scallywags to bed first! Blackbeard memorial at Springer’s Point. Join us in closing out the Festival at a rousing lunch with the pirates. Your chance to sit down with our pirate crews and enjoy a great meal.. 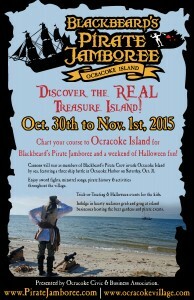 This year’s Blackbeard’s Pirate Jamboree on Ocracoke Island will be Halloween weekend–Oct. 30 to Nov. 1. This is a family-friendly event with lots of swashbuckling fun both on land and on the water! Make this your family’s Halloween destination. Bring the kids and your costumes. Lots of fun events are in the works. 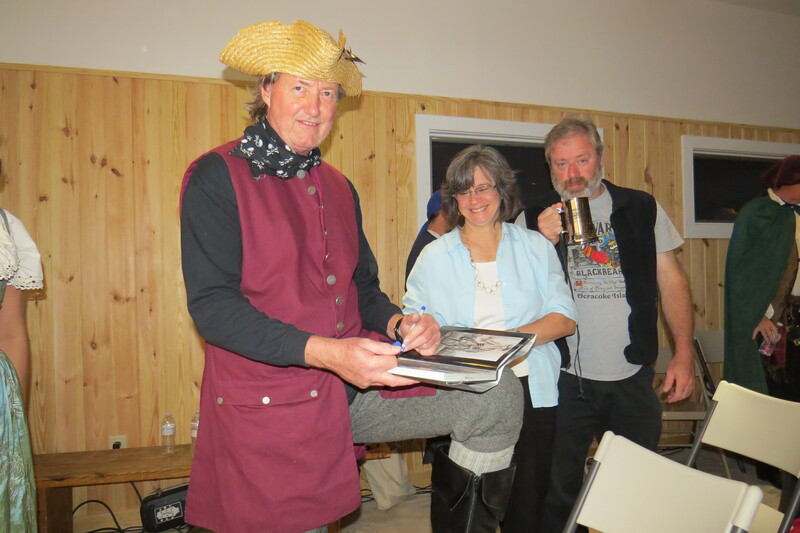 The event kicks off Friday evening Oct. 30 at 7 p.m. in the Ocracoke Community Center where visitors can “meet the pirates,” have a swig of grog and join in “Pirate Follies” along with author-historian Kevin Duffus. Halloween Day, Oct. 31, will be the big day! Everyone is encouraged to join in the fun and access your inner pirate! The centerpiece of the Jamboree is a historically accurate pirate encampment from 10 a.m. to 5 p.m. Saturday, Oct. 31, on the grounds of the Berkley Center by Blackbeard’s Pirate Crew, an 18-member living history organization from Hampton, VA. Dressed in authentic clothing from the 17th and early 18th centuries, pirates will engage visitors with storytelling, sea chanteys, navigation, seamanship, medicine and more. Kids of all ages can attend the “Scallywag School,” learn navigation by the stars and more. 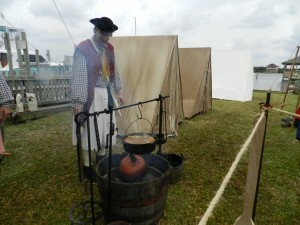 Visitors will see demonstrations of vintage black powder weapons and partake in hearty seafarers’ grub and grog. Throughout the day in several locations in the village, there will be sword fights, roving minstrels, historical talks and more for all ages. The main event will be the re-enactment of “The Battle at Ocracoke,” taking place at 1 p.m. on the island’s beautiful harbor, Silver Lake. Three ships will re-create the last hours of Blackbeard and his crew as Lt. Robert Maynard brings them to battle with cannons blazing. Among the professional pirate crews attending will be Sinbad in his Meka II, historic skipjack the Ada Mae, the Shadow Players, the Beaufort Oars in their sloop The Ranger, the Motley Tones minstrels and Chris Suttle as Blackbeard. A “Brigands Bazaar” on the Wahab House yard will feature pirate-themed wares for sale–books about Blackbeard, clothing, artwork, pottery and more. Public parking is available at the NPS Visitors lot at the south end of the island, 4352 Irvin Garrish Highway. Public restrooms are available at the NPS Visitor’s Center and in Community Square. So, get cookin’ on your pirate costumes. Kids can join in islander kids trick or treating along Lighthouse Road from 4 to 5:30 p.m. then make your way to the Ocracoke Oyster Company, 875 Irvin Garrish Hwy., for a stage combat performance by the fabulous Shadow Players. The Bawdy Beer Garden with the ever-fabulous Motely Tones continues at the Ocracoke Oyster Company after that. 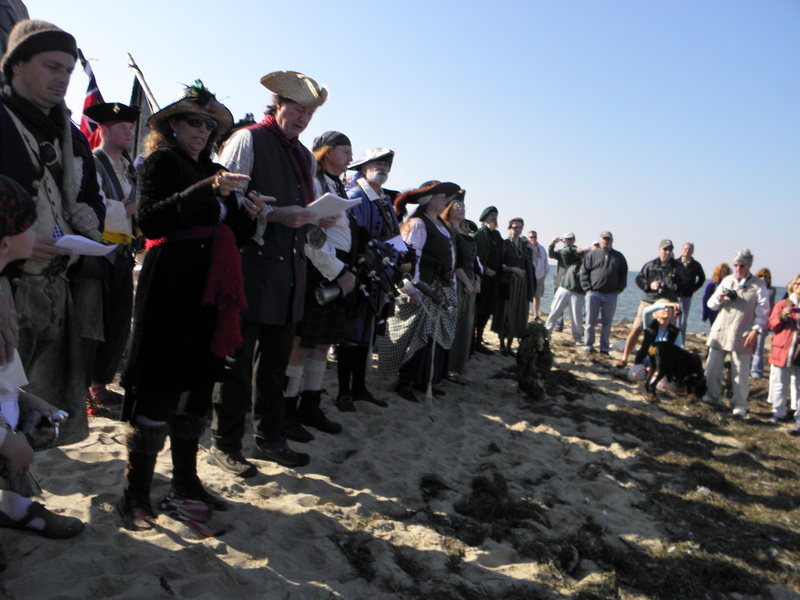 Sunday, Nov. 1, will conclude with the Pirate March at 10 a.m. to Springer’s Point for a ceremony commemorating the fall of Blackbeard offshore on Nov. 22, 1718. Pirates and visitors gather outside the encampment at the Berkley Center for the march to the water’s edge. 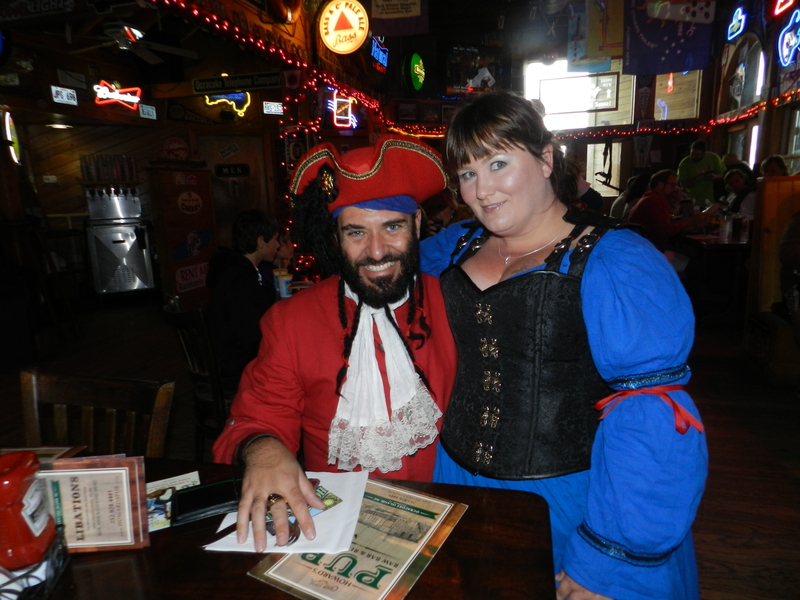 Join the pirates after the memorial for Lunch at Howard’s Pub at noon before you set sail back home! Activity details are still being finalized, but check in at www.ocracokevillage.com. 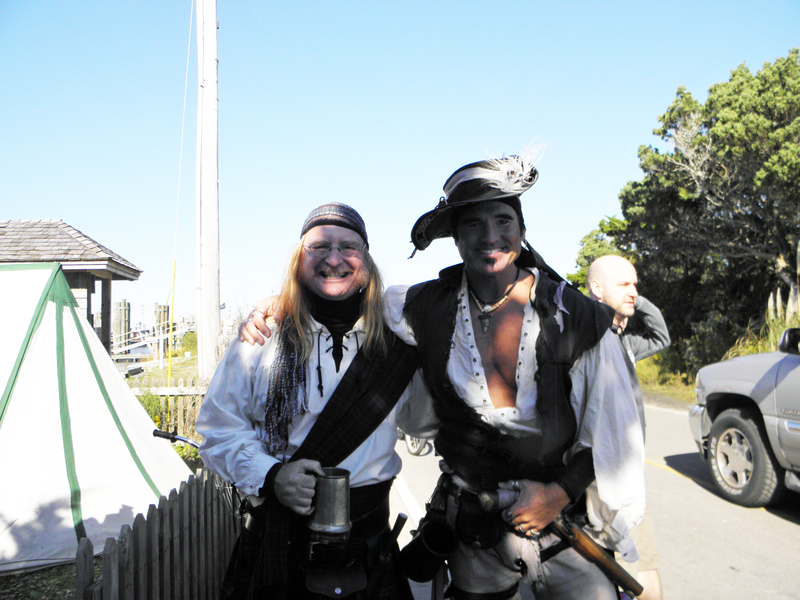 Yancey Covington, left, and Steve Whetzel, at the 2013 Blackbeard's Pirate Jamboree on Ocracoke. Steve Whetzel, who portrays Mantise Sevalle as a member of the Shadow Players, a stage combat group from Greenville, was recently featured in a New York Times sports story about the East Carolina University Pirates. 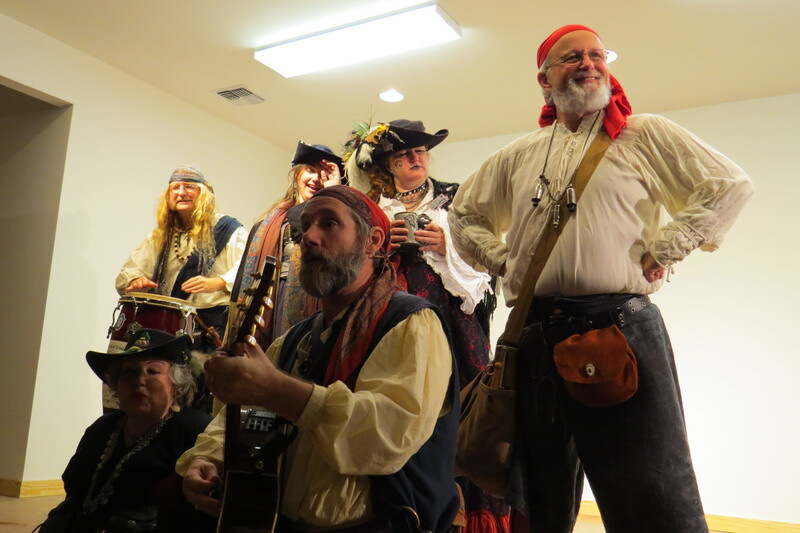 Whetzel, along with the entire troop of Players, will be part of the Second Annual Blackbeard’s Pirate Jamboree this coming Friday, Oct. 31 to Sunday, Nov. 2, on Ocracoke. They will demonstrate swashbuckling sword fighting and combat. Experience up close and personal swordplay in an interactive show for the whole family. 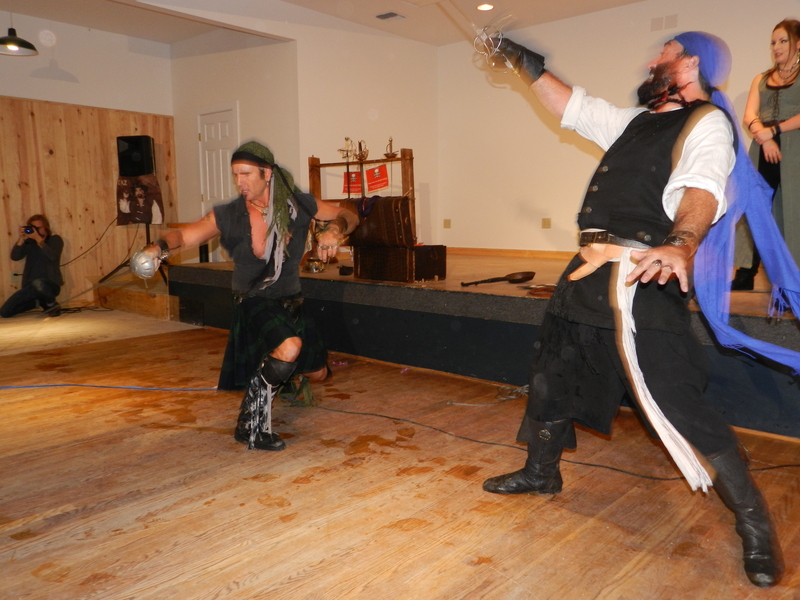 The kick off event “Meet the Pirates,” will start at 7 p.m. in the Ocracoke Community Center with a game show of myths and facts about Blackbeard, with Kevin Duffs as game-show host. The rollicking Motley Tones will follow with a concert and sing-along at 8:30. $10 donation at the door also covers alcohol and other refreshments. 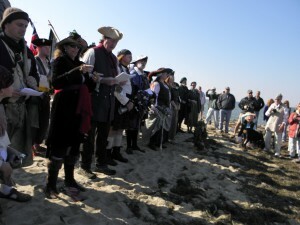 Steve Whetzel as Mantise Sevalle, a "pirate" with the Shadow Players Stage Combat Group, rings a chime for each of the fallen members of Blackbeard's crew during the memorial Sunday morning during Blackbeard's Pirate Jamboree. 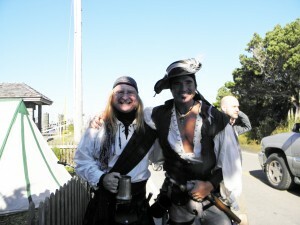 Pirates to invade Ocracoke! Arrrggh you ready? 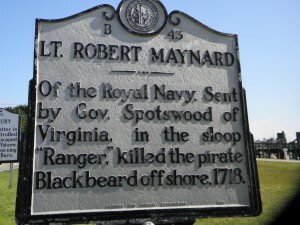 A historic marker near the National Park Service docks authenticates Blackbeard’s demise on Ocracoke. 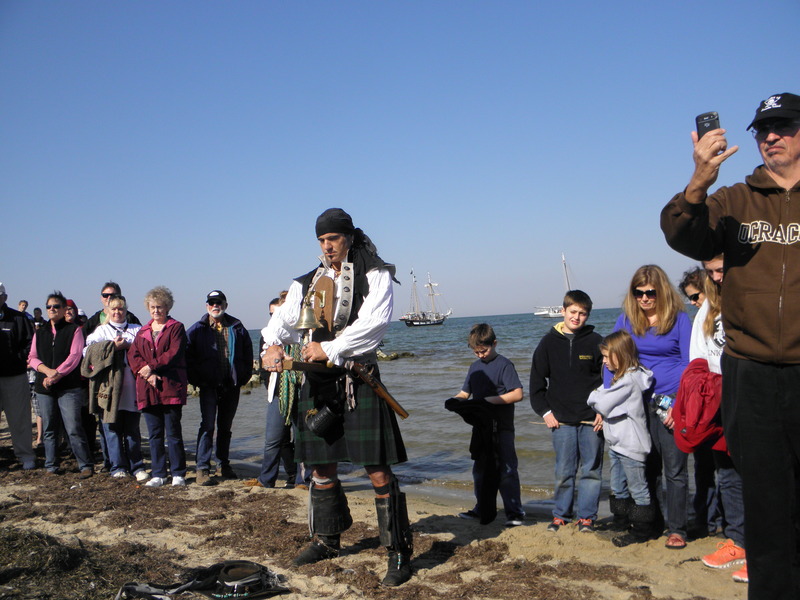 The real Blackbeard will be revealed but the popular myth will be in full display at the First Annual Blackbeard’s Pirate Jamboree on Ocracoke Island, N.C., Oct. 30 to Nov. 1, 2015. Ocracoke was a favorite hiding place of Edward Teach, or, Blackbeard. This is where Lt. Robert Maynard finally located the pirate in 1718. After a ship-board battle of swords, Maynard severed the pirate’s head then took it to Hampton, Va., on the bowsprit his boat. Various pirate reenactors are gearing up to travel to Ocracoke because of the historical significance here for Blackbeard. “The pirate crews are excited about coming here because this is a place with authentic Blackbeard history,” says Chip Stevens, owner of Blackbeard’s Lodge and one of the event organizers. Event-goers will hear information that may change their perception about the nefarious pirate. Historian-author Kevin Duffus of Raleigh, who has spent years researching the real Blackbeard, will share “myths and facts” during the weekend. Duffus will kick off the event Friday evening at 7 in the Ocracoke Community Center where attendees can also meet the pirates. Local business owners are looking forward to the fun. 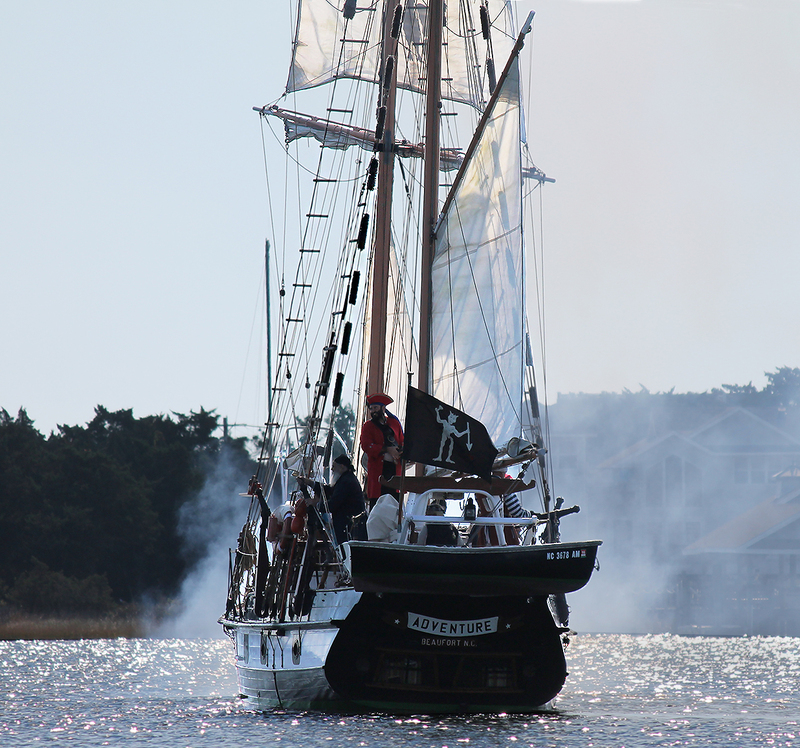 Posted in News	| Comments Off on Pirates to invade Ocracoke! Arrrggh you ready? To get to Ocracoke by car you need to ride the ferry from either Hatteras, Swan Quarter or Cedar Island. The Hatteras ferry is free and crossing take about 1 hour. The Swan Quarter and Cedar Island ferries charge a $15 fee each way and reservations are strongly suggested either online at www.ncdot.gov/ferry, or by calling: 1-800-BYFERRY. THIS SCHEDULE WILL CHANGE AT THE END OF SEPTEMBER. Please check back at this site for the October-November ferry schedule. If you have a private small plane, the Ocracoke airport is open during daylight hours. By your own boat, there is dockage available at the Anchorage Marina and the National Park Service docks.